The jit.keyscreen object takes three 4-plane char matrix and does an interchangeable choke chromakey between the three sources. 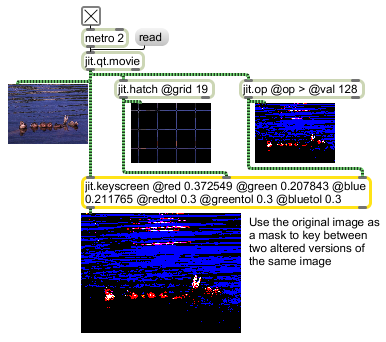 Any of the three input matrices can be designated as the key image (from which the image mask is created), the target image (which the mask is overlaid onto), or the mask image (which is placed on top of the target in the shape of the key ). The jit.keyscreen object takes a color and a tolerance range for the keying. It can work by cell or by plane (set via the mode attribute).